This Greys Prodigy Carryall & Net Bag has been designed to transport a serious amount of gear, including the Greys Prodigy Tackle Base Station. The latter fits in the main compartment, leaving plenty of room for a couple of stacks of bait boxes, a flask and other bulky items. The main compartment also has two internal rubber mesh organiser pockets, along with a useful zip pocket underneath the lid. There are two roomy external end pockets for segregating even more gear, each featuring 3 internal mesh pockets that take Greys Prodigy Small and Medium Klip Lok Base Boxes. 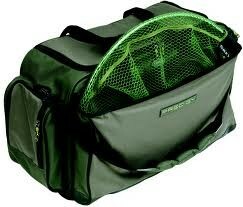 The superb Greys Prodigy Carryall & Net Bag has a big net pocket that accepts a keepnet and decent sized landing net. It's finished with Velcro locking neoprene carry handles, an adjustable padded shoulder strap, attachment rings for Greys Prodigy Klip On Unhooking Mats and a reinforced base.